FTSE Indexes were higher on Friday after regaining losses from the previous day with the market factoring in higher potential for a U.S. federal funds rate increase in June. The FTSE 100 was higher by 102.97 points or 1.70 percent to close at 6,156.32. 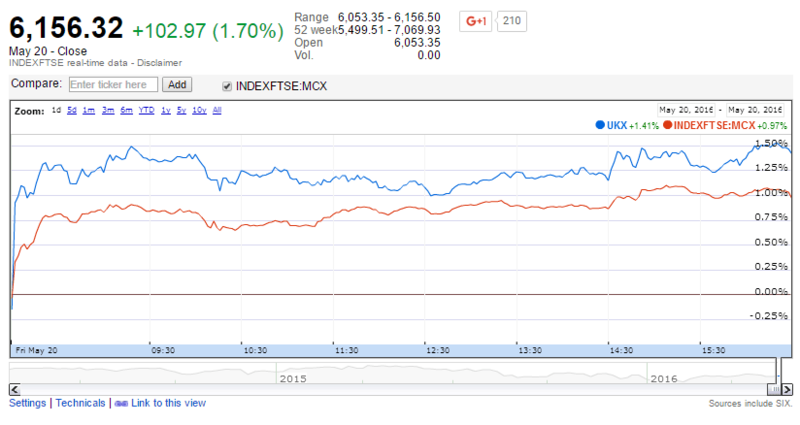 The FTSE 250 was also higher at 16,922.06 for a gain of 191.95 points or 1.15 percent. Mining and oil stocks led the day’s trading higher as oil prices gained. Anglo American and Antofagasta were among the top stocks gaining for the day. Shire and Coca-Cola HBC also gained significantly Friday after analysts reported upgrades in stock valuations and sales outlooks. Bookmakers Ladbrokes and Coral were also in the news Friday after regulators reported the companies would need to sell hundreds of specified stores in order for a merger to be in compliance. Ladbrokes was higher for the day, gaining 7.80 points or 6.53 percent to close at 127.30 GBX as the merger deal with privately held Coral proceeded. Few stocks traded lower Friday as the market broadly gained. Among the few to report losses included International Consolidated Airlines Group and RSA Insurance Group. In the U.K., volatility continued to remain high as the country considers an exit from the European Union. U.K. officials are also considering economic policy stimulus as the outlook for the economy in the second half of the year appears to be weakening. Data from IFA magazine reported the following stocks leading gains and losses in the U.K. on Friday. In other European markets, France’s CAC 40 was higher at 4,353.90 for a gain of 71.36 points or 1.67 percent. The Stoxx Europe 600 was higher at 338.01 for a gain of 4.10 points or 1.23 percent. Germany’s DAX was higher at 9,916.02 for a gain of 120.13 points or 1.23 percent. The Europe Dow was higher at 1,525.95 for a gain of 20.12 points or 1.34 percent. In Asia, stocks were also mostly higher. Japan’s Nikkei closed at 16,736.35 for a gain of 89.69 points or 0.54 percent. Hong Kong’s Hang Seng was higher at 19,852.20 for a gain of 157.87 points or 0.80 percent. China’s Shanghai Composite was higher at 2,825.48 for a gain of 18.58 points or 0.66 percent. In India, the S&P BSE Sensex was lower at 25,301.90 for a loss of -97.82 points or -0.39 percent and the NSE Nifty was lower at 7,749.70 for a loss of -33.70 points or -0.43 percent. The Asia Dow was higher at 2,569.89 for a gain of 5.75 points or 0.22 percent. In the U.S., stocks traded mostly higher on Friday. For the day, the Dow Jones Industrial Average gained 65.54 points or 0.38 percent to close at 17,500.94. The S&P 500 was also higher at 2,052.32 for a gain of 12.28 points or 0.60 percent. The Nasdaq Composite was higher at 4,769.56 for a gain of 57.03 points or 1.21 percent.